Friendly and practical, with vast experience across the building industry, we believe that anyone working with Mark Farrant Building Ltd is in good hands. Mark studied architectural draughting for two years before starting his building apprenticeship. 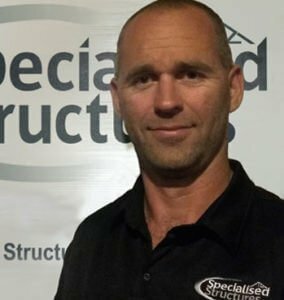 With over 25 years in the construction industry, Mark has a wealth of knowledge across all fields of construction, and a willingness to share that knowledge with his clients. The massive range of products and plans, plus history, experience and buying power are what Mark sees as the key strengths of Specialised Structures. More importantly, he likes the fact that he can cost-effectively design and build specifically to his client’s requirements. A Timaru resident for the last 30 plus years, Mark also has a good understanding of the challenges involved with building in your local environment.